Many Katahdin Cedar Log Homes are constructed in rural areas, often at the end of a private road. Constructing a home on undeveloped land often requires charting a course to the actual building site. In many cases, the route through the woods to the site will involve more steps than a simple driveway requires. In many locations, building road infrastructure must account for the changes the construction will make on the existing topography, particularly regarding water runoff during precipitation. If the location is traversed by a body of water, the management of water runoff becomes a matter of environmental impact. This article is designed to help our customers understand the basics of engineering requirements for a private roadway. 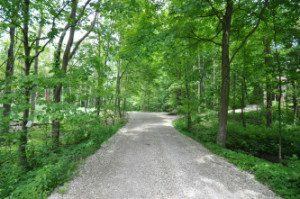 Knowing the potential factors in private roads can help to identify which parcel may be the best for a certain budget. In other words, a little understanding of roads decreases the potential for costly surprises. Most private roadways utilize culverts or ditches to manage water runoff. Culverts provide a pathway for rainwater underneath a roadway, while ditches are open channels to ensure water goes where it needs to go. If you’re near a body or water, water flow, runoff and the accompanying silt are defining factors as to the construction and placement of culverts and ditches. Culverts can be made of several sturdy materials: steel, aluminum or polyurethane. 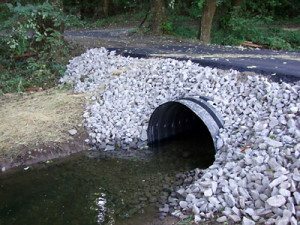 The latter can be much less expensive than metal culverts, never rust, and are lighter and easier to handle. The polyurethane culverts can also be sawn with a hand saw. Sizing for the culvert should be no less than 15 inches in diameter. If there is a defined stream bed, a minimum of 18 inches is recommended. However, it is important to size for the unusual 25- to 50-year flood event, unless local conditions indicate otherwise. The US Forest Service offers a useful sizing guide that accounts for many different factors in water movement, including grade, soil type, acreage being drained and other factors. Their guide for crossing streams can be found here. Undersizing a culvert can have disastrous effects, including flooding, ponding and road washouts. Ditches, which can run alongside the roadway can also direct excess water from rainfall away from the roadway to prevent washouts. Ditches are best dug as deep extended U-shapes, meaning deep and curved sides to better manage water flow. V-shaped ditches are not effective. Another factor in directing water on private property is where the water ultimately drains. Most states require some sort of catchment or drain filtration to keep silt and debris from entering nearby water bodies. Often the easiest way to reduce the speed of draining water is to direct it toward established vegetation where the trees, bushes and grasses can filter the runoff and slow the flow into a body of water. Using large sharp-edged stones called riprap to line a catch basin can slow the flow and filter some of the sediment from the water. Culverts are identified by the inlet end where the water enters the culvert and the outlet end, where the water exits the pipe. The inlet end should be aligned so that the bottom of the culvert is level with the bottom of the stream bed or ditch. When the culvert is misaligned, the water stream may undercut the culvert and cause the soil and roadway to collapse into the diverted streambed. If the culvert is placed on a slope, the outlet location of a riprap holding area to slow down the water flow is also indicated. To maintain the best flow, the culvert needs to be seated in firmly packed earth with more packed material around the pipe to prevent erosion. To prevent settling in the road, the culvert needs to have enough soil material covering it, generally a depth of at least half the diameter of the culvert. Also make sure that the materials surrounding the culvert are all like soils so that compaction and settling will be even and stable. With this basic information, inspecting a property with changing topography, proximity to water or dramatic rainfall potential can help anticipate several factors. These factors might include how many culvert locations might be required to bring the road into the building site, whether additional permitting would be required, how much fill might be required to keep the road relatively level among others. Of course, a formal engineering review would more clearly define these costs, but a savvy homeowner can identify these expenditure areas prior to writing an offer.